We see patients with a wide variety of conditions! We have a high success rate for pain relief, and improved health and wellness. We focus on the whole body! Using other aspects of wellness along with chiropractic philosophy helps us help you. 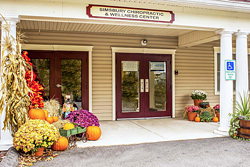 “Ours is a holistic wellness program with the goal of helping people to feel better.” There is power in an adjustment. There is also power in nutrition and exercise. Our wide variety of natural health techniques, allows us to help you with the following conditions! Let’s get together to discuss your needs. Together we will determine if you need acute care or corrective care. We’ll educate you so you can make an informed decision. Leading you down the path to wellness is top priority. Bring your aches and pains. Bring your family. Bring your goals and questions. Make your first appointment today! Call (860) 651-3355 to get started!